Author: Evelyn Abad. Originally published by asianweek.com. Landing at the airport near Cebu City filled me with a mix of emotions: happy to be returning to my homeland again, excited for another mission with Rotaplast International that will change the lives of the children we treat, and a little bit misty to think of the journey I’ve traveled in my life—from a little girl in the Philippines to a new start in the 1960s as an exchange student in the U.S., where I have spent most of my 70 years. This mission is even more poignant for me. Last year, the Philippines was hit by a double shot of disaster: the earthquake of October 2013 that took the lives of nearly 100 people and injured hundreds more, and then a month later, the devastating Typhoon Yolanda struck—6,000 people killed and more than three million people displaced. So it is with a hopeful and heavy heart that I return to the land of my birth. Seeing the familiar faces of our Cebu City Rotary volunteers greeting us at the airport was a joy. We have been here 12 times now, and the local Rotary volunteers have become experts at making our missions as smooth as possible. We were about to start two weeks of very important surgical work. I organize all the medical volunteers for Rotaplast’s 12-16 annual trips. When I retired as an operating room nurse in 1998, I had no idea I would be traveling the world for so many years working with such a good organization and such wonderful people. I was recruited by Rotaplast to fill in temporarily. What I thought would be a short humanitarian effort quickly changed—within two days, I was the head nurse on the mission. I haven’t looked back once in the past 16 years of organizing these missions. The schedule in Cebu City was rough: it took a day to fly here, we had two days to prepare the surgery clinic and meet with potential patients, and then it is a full week of surgeries with only one day of rest. Despite the grueling schedule, I can’t tell you how rewarding it is to know that what I am doing—and what the entire volunteer team is doing—permanently changed these little ones’ lives. In the U.S., cleft lip and palate anomalies are easily treated—they are usually repaired within the first months of a child’s life. But in countries like the Philippines, or other developing countries I’ve visited— Ethiopia, Bangladesh, Guatemala, Togo, China, Vietnam, and Ecuador to name only a few—parents do not have the resources for such reparative surgeries. Too often in these cultures, people think of cleft lips as a curse or a punishment for the parents. Parents even hide their children, who are subject to ridicule and isolation. Cleft lips and palates have an impact on children’s ability to eat, thus they often suffer from malnutrition. And they can also suffer medical complications such as infections and hearing loss. Earlier this October, I had the honor of helping many children in Cebu City. Little Rosyl Delicano is only one year old, and her mother traveled with her for more than four hours to have us repair Rosyl’s cleft lip. The Gonzaga family traveled 14 hours for help. The Gonzagas lost their grandfather and all their possessions after Typhoon Yolanda last year. They arrived at the clinic with not just their 18-month-old daughter Keisha, but also their six-month-old infant, John. He too needed reparative surgery, so we made room in the schedule to take care of the siblings. The look of joy on Keisha and John’s mother’s face—as is the case with so many parents we meet—when we brought their children out of the OR was reward enough for the work we do. Seeing the results of your efforts is extremely gratifying. In Cebu City, there are twin girls we had operated on five years ago who have become regular volunteers on our Rotaplast missions in the Philippines. They help with all the work at the site. They are teenagers now, but they always make time to assist us when we return. There is nothing more wonderful than coming back to my own country to help my people. Knowing what we’ve accomplished here fills me with gratitude. I hope immigrants around the world can also find a way to give back to their home countries. 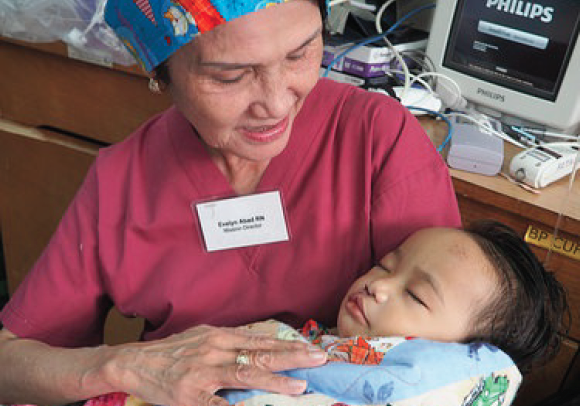 Evelyn Abad is the Medical Staff Coordinator for Rotaplast International, Inc. a volunteer medical mission supported by Rotary districts and clubs worldwide to perform corrective surgery on children with cleft lip and palate anomalies in developing countries. Abad, a member of the Rotary Club of San Francisco, returned to her home country of the Philippines in October 2014 as part of Rotaplast’s 12th mission to the island of Cebu.